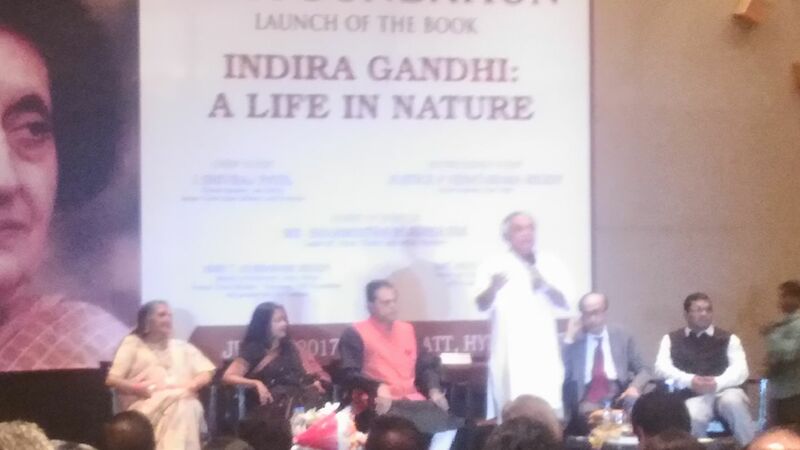 Hyderabad - The elite of the city, on the 7th of July, 2017, witnessed former Environment Minister, Mr. Jairam Ramesh discussed the launch of his book on Indira Gandhi, which showcased the former Prime Minister's lesser known traits as a conservationist. Mr. Ramesh stated that the World had known two Indira Gandhi's. One as the "Durga", as named by Sri Atal Bihari Vajpayee, who helped Bangladesh Independence, and brought about the Green Revolution and the other as the Indira of Emergency, who seized power and also let Sanjay Gandhi start a Maruti plant which never produced cars. Because of the presence of the two contradictory pictures of Mrs. Indira Gandhi, Mr. Ramesh stated that he had attempted to write this book after going through numerous letters Mrs. Gandhi had written during her lifetime, to determine what kind of person she actually was. Mr. Rameshj went on to speak about how Mrs. Gandhi was essentially a reluctant politician, one who loved nature and its inhabitants and how the Green Revolution was an example of how she had converted a personal passion into public policy. Mr. Ramesh further shed some light on Mrs. Gandhi's stay in Santiniketan and her admiration for the noted Bengali poet Sri Rabindranath Tagore, which led her to convert some of his poems to English. Noted author & columnist Mr. Sriram Karri discussed the latest book of Mr. Jairam Ramesh, 'Indira Gandhi: A Life in Nature', after its launch in Hyderabad at Park Hyatt. The event was organized by TSR Foundation Hyderabad and saw many noted celebrities like Md. Azharuddin (Ex Indian Cricket Team Captain), Mr. T Subbaramireddy among others.